In a Written Ministerial Statement to the Commons today the Lord Chancellor and Secretary of State for Justice, Chris Grayling, set out plans to reform judicial pensions. 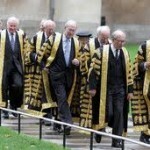 Although there is an arrangement that the remuneration package (including pensions) should not be reduced for serving judges, it was deemed that the context of pension cuts across the public sector justified the changes, and that they would not infringe the principle of judicial independence. The new scheme will be managed separately from other public service pension provisions by the Lord Chancellor’s Department. It will be brought in for all serving judiciary from 1 April 2012, except for those who are within 10 years of pension age at that date – they are exempt. This is significant as around 75% of judges are within 10 years of retirement age. Also, “tapering protection” will be offered to those who fall just outside the age requirement – they will have the option to defer joining the new scheme until a later date. The Government’s view is that despite the planned reductions the judicial pension scheme will remain among the most generous in the public sector. Leave a reply on "Changes to judicial pensions announced"